William Quincy Belle: Rob Ford: Can I count on this man? Or should I ask, can this man count? I hate to keep coming back to an issue like a dog with a bone, but Mr. Ford has consistently said things where the numbers when added up do not match what he's saying. This leads me back to the belief that while the slogans sound good - Stop the gravy train! - is there substance behind the rhetoric? This Canadian think tank has released a report today comparing the costs and benefits of Transit City's four-line LRT to the subway extensions proposed by the mayor in December. Keep in mind that the LTR plan is already underway. If it is cancelled, there will supposedly be an immediate loss of $130 million in the form of the investments already made. On top of that, there would be potential losses of $1.3 billion due to the cancellation of signed contracts. As well as overall ridership, the subway plan would only touch 7,200 people in the low-income population while the LTR would involve 45,000. It's curious. The LTR is already underway and would first go into service in 2014, three years from now. The alternative subway would not see the light of day until 2020, nine years from now. Whatever the final decision, and for this we have to wait until the end of the month when the TTC comes back to Rob Ford with their own plan for what's the best thing to do, somebody needs to take an objective look at this entire issue. The numbers raise so many questions that I for one find it difficult to believe that Mr. Ford has made a decision without having all the facts and certainly not all the figures. Please remember that I am saying this because this is not the first time Mr. Ford has done this. Mr. Ford yells out the answer "4" but then we find out the problem is two plus three. Do I have to state the obvious? The answer is not four. The Pembina Institute is a Canadian not-for-profit think tank focused on developing innovative sustainable energy solutions. Founded in 1985, the Institute has offices in Calgary, Drayton Valley, Edmonton, Ottawa, Toronto, Vancouver, and Yellowknife. Making Tracks to Torontonians examines the costs and benefits of the subway extension proposed by Toronto Mayor Rob Ford in December 2010, compared to the light rail transit plan that is already underway with funding on the table. 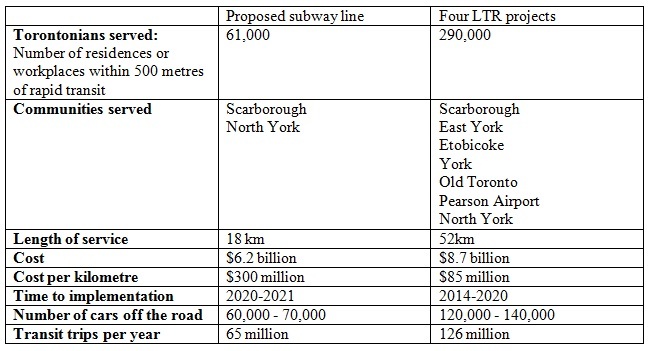 The subway extension would provide less service per dollar invested than the existing light rail rapid transit plan for Toronto, and wouldn't deliver transit service to the communities that need it most. Ms. Grant correctly criticises some of the numbers lobbed around by TEA (Toronto Environmental Alliance). The Pembina report itself avoids any hyperbole but regardless of any criticisms, the differences between the subway and the LTR should make anybody stop dead in their tracks and demand an independent recount of the Ford subway plan before voting for it. If the subway is the future, then the future looks pretty bleak. There is (on average) a malfunction once a week on the Bloor-Danforth line ranging from smoke on the tracks, switch problems, and personal injuries. I take the TTC everyday to school and work and I see these delays happen often. Subways can be good, but we need alternatives.